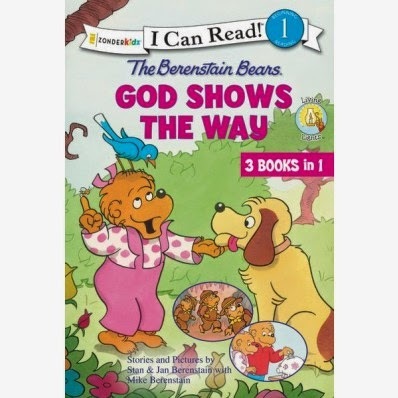 Now in a convenient 3 stories in one collection, young readers will learn from the Berenstain Bears just how important it is to serve and love one another. Written in level one of the I Can Read standards, this bind-up of stories from the Berenstain Bears Living Lights I Can Read series is sure to please young, emergent readers as well as parents and grandparents looking for good quality reading that will help practice early reading skills as well as teach lessons about serving and caring for others. Included in this collection are the following titles: Faith Gets Us Through, Have No Fear, God Is Near, and Piggy Bank Blessings. Faith Get's Us Through: The Bear Scouts are ready to earn their Cave Adventure Merit Badges. How will Scout master Papa Bear help the cubs. This first book in the series had me laughing at Papa bear as he shows his confidence but after many hurdles finally gets out of the cave. My children enjoyed the laughs through this story but it also was great to teach about faith and trust. Have no Fear, God is Near: Sister Bear has overcome many fears like bugs, big dogs and storms. But even with the reminder that God is always watching over her, there are some things that still scare the young cub. Will sister remember to trust in God when something spooky startles her? I enjoyed this story because many kids still have a fear even when they know and understand that God is near them. My daughter is 6 and is very afraid of anyone in a costume when you can't see the person's face. Going to parades and amusement parks has turned into uncontrollable shaking and crying from her. She has had this fear for as long as I can remember. It is very strange because she never had a bad or scary experience in her past. In fact we have never ever done Santa or Easter bunny pictures. We have always avoided them and always kept our focus on the true meaning for the holiday. I like this story because it shows sister bear overcoming the fear! The last one is Piggy Bank Blessings: Mama Bear thinks it is time to teach the cubs about saving money for something special. Even the Bible says each one of us should put aside some of our earnings! But will the bugs listen to Mama and Scripture, or will they spend their money on things they do not need? This story is great in teaching saving but I wish it would have touched more on our tithe to the Lord.